Understanding and organizing data is increasingly important as organizational repositories and websites grow in size and add more content -- including content uploaded by visitors. 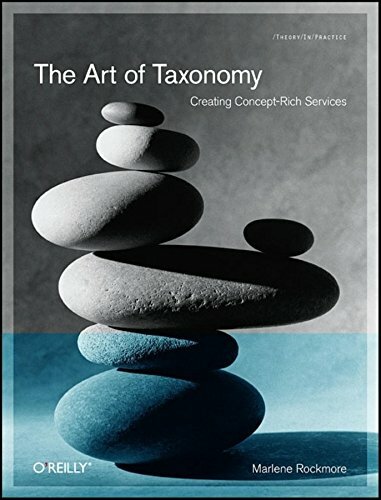 The Art of Taxonomy introduces low-cost, low-risk tools and techniques for using taxonomies to help. With them, you can implement high-performing applications, manage websites and content management systems (CMS), improve search results, direct visitors to content of interest, and even predict trends in your field. The Art of Taxonomy shows you how to improve search and navigation to your data, supply links to related content, and target feeds to different audiences. Thoroughly practical and bolstered by in-depth case studies, this book will teach managers, site administrators, programmers, and content contributors how to deal more effectively with the systems that emerge on their sites. Marlene first worked with taxonomies when completing MLS at Simmons College, and then had a chance to develop a faceted taxonomy-based content management system at Digital Equipment Corporation. She gave a presentation on "Facet Analysis and Corporate Information Retrieval' at the 1st International Conference on Knowledge Organization in Darmstadt, Germany twenty years ago. She has worked at Harvard Business School Publishing, worked as a contributing writer with online curriculum development, and continues to monitor developments in taxonomy and metadata. Marlene has a blog, theTaxonomyblog.wordpress.com, where she, along with other taxonomists, contributes articles about their insights and practices. Joseph A. Busch is the founder of Taxonomy Strategies and one of theprincipal consultants. He guides companies with global reach,government agencies, international organizations, and not-for-profitssuch as Oracle, the U.S. Environmental Protection Agency, theInternational Monetary Fund, and Harvard Business School Publicationsin developing metadata frameworks and taxonomy strategies. Before founding Taxonomy Strategies, Joseph Busch held strategicpositions within Interwoven, Metacode Technologies, the GettyInformation Institute, and PriceWaterhouse. He is a Past President ofthe American Society for Information Science and Technology(http://www.asis.org), and an appointee to the Board of Directors ofthe Dublin Core Metadata Initiative (http://dublincore.org). Ron Daniel, Jr. is a Principal at Taxonomy Strategies. Before becominga partner at Taxonomy Strategies, Dr. Daniel held technical positionsat Interwoven, Metacode and Los Alamos National Laboratory. He is anexpert on XML and metadata industry standards. He has served as chair,editor, or member in numerous working groups including the PRISM(Publishers Requirements for Industry Standard Metadata) working group(prismstandard.org), XML Linking, RDF (Resource DescriptionFramework), and Dublin Core (dublincore.org). He co-edited three RFCsfor the Internet Engineering Task Force. Ron earned his Ph.D. inElectrical Engineering from Oklahoma State University and was apostdoctoral researcher at Cambridge University and Los AlamosNational Laboratory. Michael Lauruhn is a librarian who has worked at Internet companiessince receiving his Masters of Library Science in 2000. As part of anew generation of information professionals, he has worked to applylibrary, information and compuscience to the new challenges ofdistributed heterogeneous content and the World Wide Web. He hasworked on many projects to integrate metadata into the contentmanagement workflow. Before becoming a Member of Taxonomy Strategies,Mr. Lauruhn held technical positions at CMP Media, Interwoven andLooksmart.com.